It looks like most of the stores will be open at midnight this year, Target is no exception. 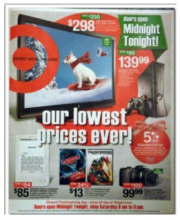 Looking over the Target ad, I’m not feeling the holiday love since these prices still seem a bit high. I’m going to do some price comparisons this weekend and will let you know if I find better deals over at Amazon.com! I cant say I have been too impressed with any of them I’ve seen! I know! I’m really disappointed this year. Usually the stores have at least one good sale but I’m not seeing anything out there!